This sturdy spindle is designed to facilitate new or vintage doorknobs with threaded shanks of 16 TPI. Constructed of hardened steel, it provides smooth operation and long-lasting wear. With a 3 1/2" length, it's ideal for standard doors, and features a 7mm thickness. This sturdy spindle is designed to facilitate new or vintage doorknobs with threaded shanks of 16 TPI. Constructed of hardened steel, it provides smooth operation and long-lasting wear. With a 4" length, it's ideal for standard doors. Features a 9/32" thickness. This sturdy spindle is designed to facilitate new or vintage doorknobs with threaded shanks of 20 TPI. Constructed of hardened steel, it provides smooth operation and long-lasting wear. 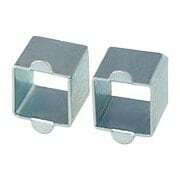 With a 3 1/2" length, it's ideal for standard doors. Features a 9/32" thickness. This sturdy spindle is designed to facilitate new or vintage doorknobs with threaded shanks of 20 TPI. Constructed of hardened steel, it provides smooth operation and long-lasting wear. With a 4" length, it's ideal for standard doors. Features a 9/32" thickness. This sturdy spindle is designed to facilitate new or vintage doorknobs with nonthreaded or threaded shanks of 20 TPI. Constructed of hardened steel, it provides smooth operation and long-lasting wear. With a 4" length, it's ideal for standard doors. 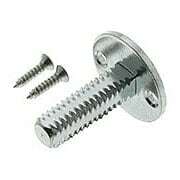 Features a 9/32" thickness and tapped for 10-24 set screws. This sturdy spindle is designed to facilitate new or vintage doorknobs with threaded shanks of 20 TPI. Constructed of hardened steel, it provides smooth operation and long-lasting wear. With a 5" length, it's ideal for thicker doors. Features a standard 9/32" thickness. This sturdy spindle is designed to facilitate new or vintage doorknobs with nonthreaded or threaded shanks of 20 TPI. The hardened steel construction provides smooth operation and long-lasting wear. With a 5" length, it's ideal for thicker doors. Features a standard 9/32" thickness and tapped for 10-24 set screws. This sturdy dummy spindle is designed to facilitate fixed doorknobs, with threaded shanks of 16 TPI, that don't operate a latch. Constructed of solid steel for durability, it features a 9/32" standard thickness. With a 1 1/4" length, it's ideal for closet, pantry, and French doors. This sturdy spindle is designed to facilitate fixed doorknobs with threaded shanks of 16 TPI that don't operate a latch. Typically used on closet, pantry, or French doors, it's constructed of solid steel, and features a 7mm thickness. This sturdy spindle is designed to facilitate new or vintage doorknobs with threaded shanks of 16 TPI. Constructed of hardened steel, it provides smooth operation and long-lasting wear. With a 5" length, it's ideal for thicker doors. Features a standard 9/32" thickness. This sturdy spindle is designed to facilitate new or vintage doorknobs with threaded shanks of 18 TPI. Constructed of hardened steel, it provides smooth operation and long-lasting wear. With a 4 1/2" length, it's ideal for thicker doors. Features a 9/32" thickness. This sturdy spindle is designed to facilitate new or vintage doorknobs with threaded shanks of 16 TPI. Used with privacy latches and mortise locks, its hardened steel construction provides smooth operation and long-lasting wear. At 5" in length, it's ideal for thicker doors. Features a standard 9/32" thickness. This sturdy spindle is designed to facilitate new or vintage doorknobs with threaded shanks of 16 TPI. Used with privacy latches and mortise locks with larger hubs, its hardened steel construction provides smooth operation and long-lasting wear. At 4 3/4" in length, it's ideal for thicker doors. Features two 3/8" solid centers and a standard 9/32" thickness. This sturdy spindle is designed to facilitate new or vintage doorknobs with threaded shanks of 18 TPI. Used with privacy latches and mortise locks with larger hubs, its hardened steel construction provides smooth operation and long-lasting wear. At 4 3/4" in length, it's ideal for thicker doors. 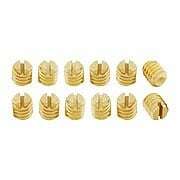 Features two 3/8" solid centers and a standard 9/32" thickness. This sturdy spindle is designed to facilitate new or vintage doorknobs with threaded shanks of 20 TPI. Used with privacy latches and mortise locks, its hardened steel construction provides smooth operation and long-lasting wear. At 4 3/4" in length, it's ideal for thicker doors. 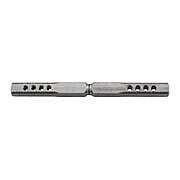 Features a standard 9/32" thickness and stop pin for stability. This sturdy spindle is designed to facilitate new or vintage doorknobs with threaded shanks of 20 TPI. Used with privacy latches and mortise locks, its hardened steel construction provides smooth operation and long-lasting wear. At 4 3/4" in length, it's ideal for thicker doors. 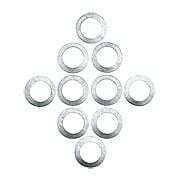 Features a standard 9/32" thickness and removable 3/8" centers. This sturdy spindle is designed to facilitate new or vintage doorknobs with threaded shanks of 20 TPI. Used with privacy latches and mortise locks, its hardened steel construction provides smooth operation and long-lasting wear. At 4 3/4" in length, it's ideal for thicker doors. Features a standard 9/32" thickness and two 3/8" solid centers. This sturdy sectional spindle is designed to facilitate new or vintage doors with a knob on only one side, with threaded shanks of 20 TPI. Its hardened steel construction provides smooth operation and long-lasting wear. Features a standard 9/32" thickness. This sturdy spindle is designed to facilitate new or vintage doorknobs with threaded shanks of 16 TPI. Used with privacy latches and mortise locks, its hardened steel construction provides smooth operation and long-lasting wear. At 4 3/4" in length, it's ideal for thicker doors. Features a standard 9/32" thickness and stop pin for stability. This heavy-duty spindle is designed to facilitate new or vintage doorknobs with non-threaded shanks. Used with privacy latches and mortise locks, its hardened steel construction provides smooth operation and long-lasting wear. At 5" in length, it's ideal for thicker doors. 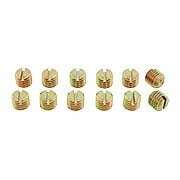 Features a 3/8" thickness, and tapped for 10-24 set screws. This heavy-duty swivel spindle is designed to facilitate new or vintage doorknobs with threaded shanks of 20 TPI. Used with privacy latches and mortise locks, its hardened steel construction provides smooth operation and long-lasting wear. At 5" in length, it's ideal for thicker doors. Features a 3/8" thickness. This heavy-duty spindle is designed to facilitate new or vintage doorknobs with threaded shanks of 20 TPI. Used with privacy latches and mortise locks, its hardened steel construction provides smooth operation and long-lasting wear. At 5" in length, it's ideal for thicker doors. 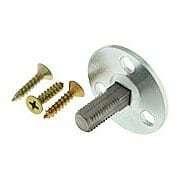 Features a 3/8" thickness, and tapped for 10-24 set screws. 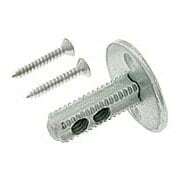 This sturdy 1-Inch Threaded Dummy Spindle is designed to facilitate fixed doorknobs with threaded shanks of 20 TPI that don't operate a latch. Typically used on closet, pantry, or French doors, it's constructed of solid steel, and features a 9/32" standard thickness. 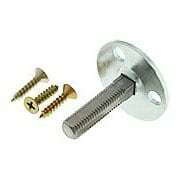 This sturdy 1 1/2-Inch Threaded Dummy Spindle is designed to facilitate fixed doorknobs with threaded shanks of 20 TPI that don't operate a latch. Typically used on closet, pantry, or French doors, it's constructed of solid steel, and features a 9/32" standard thickness. Our handy spindle sleeve converter is designed to enable a 9/32" (7mm) wide spindle to fit snugly into a 5/16" (8mm) hub. Made of steel, with zinc plating for durability, it offers more stability and a smoother performing doorknob. 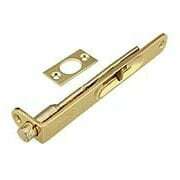 Our Solid-Brass 6" Flush-Mount Door Bolt is an understated alternative to more decorative surface bolts. Mounted on the inside edge of the stationary door, it fits perfectly flat to the door surface. Choose from an array of popular finishes to match your door handles and hinges.